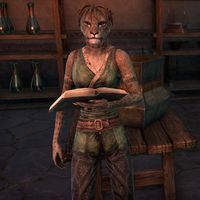 Uzipa is a Khajiit home goods furnisher who can be found at the Vivec City Furnishing in the Canton of St. Delyn the Wise in Vivec City. She played a small part in the deprecated housing quest where, after recovering a housing deed, Canthion would direct you to her to purchase furniture for your new property, providing you started the quest in Vivec City to obtain the Saint Delyn Penthouse. "It is always a good time to upgrade your decorations. Come, see my selections." "This one has many pretty things for a fine homeowner such as yourself. Would you like to see?" "Need something for your home? This one can surely provide it." "Do not worry about Red Mountain. Vivec always protects us and our homes. Truly, your purchase will not be regretted." 0000300300  This is a small house item. 0005050 This is a large house item. 0005050 This is a huge house item. 0001010 This is a standard house item. 000055 This is a standard house item. 0000300300  This is a standard house item. 0000300300  This is a large house item. 0006060 This is a standard house item. 0000750750  This is a small house item. 0007070 This is a large house item. 00230230 This is a large house item. 00290290 This is a large house item. This page was last modified on 15 March 2018, at 22:46.